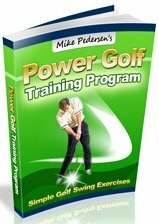 Assuming that you have already learned some basic kettlebell exercises, you may want to add some more advanced techniques to your golf weight training program. 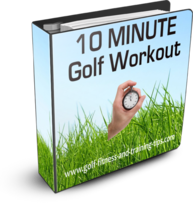 These exercises involved more complicated movements, and will use a wide variety of muscle groups. 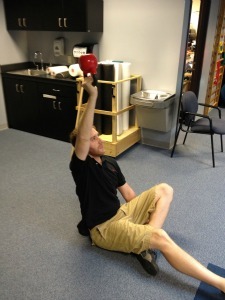 Remember, kettlebell exercises are not for everyone! If you are new to strength training, I would highly recommend starting with traditional exercises first before experimenting with kettlebells. Kettlebell workouts require more advanced motions, and if not performed correctly, could lead to injury. -Start by lying on your right side, grasping the kettlebell with your right hand. -Transition to lying on your back, and lift the kettlebell towards the ceiling, so that your arm is perpendicular to the ground. 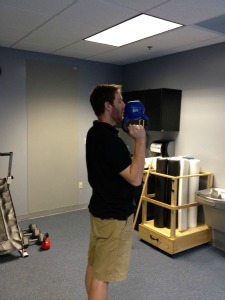 -Keep holding the weight overhead, while moving towards a sitting position. -Tuck one leg underneath of you and move to a kneel. -Now stand up. Reverse the process and return to the ground. -Stand with feet shoulder width, kettlebell on the ground between your feet. Squat down by keeping your back straight, rear end back, and knees bent. -Grab the handle with your right hand, and as you stand up, quickly use your body momentum combined with elbow flexion to raise the weight up to your right shoulder. -At this position, tighten your abs and slightly round your shoulders to provide more support. -When you are ready, forcibly elevate your arm overhead and rotate it so that your hand faces backwards. 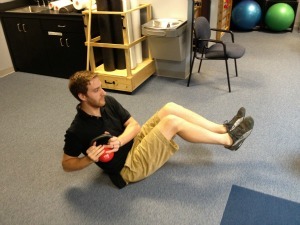 -Reverse the process and return the kettlebell to the ground. -Stand, feet shoulder width, and kettlebell between your feet. Squat down by bending your knees and sticking your rear end out. -Grasping the weight, gently swing it backwards between your legs, and then forcibly drive forward with your hips and swing the bell to shoulder level. -Let the weight swing back down and through your legs, repeating the process again. Another way to make this exercise more challenging is to switch the kettlebell to the other hand at the top of the swing. Simply keep alternating the weight between your hands to get a workout for both arms! -Stand, with two kettlebells beside each foot. Bend forward at your waist, keeping your back straight, and your knees slightly bent. -Grab each handle, and with one arm pull up in a row motion, pinching your shoulder blade back at the top. -Lower the weight, and repeat on the other side. -Sit on the ground with knees slightly bent, holding the kettlebell with both hands at your chest/mid section level. -Keep your back straight and lean back, elevating your legs off of the ground. Hold this position. -Rotate at your trunk and with your arms, gently touching the weight to the ground along your right side, and then along the left side. -Try to see how long you can rotate before becoming too fatigued. This exercise can also be made harder by keeping your knees straight while they are elevated.